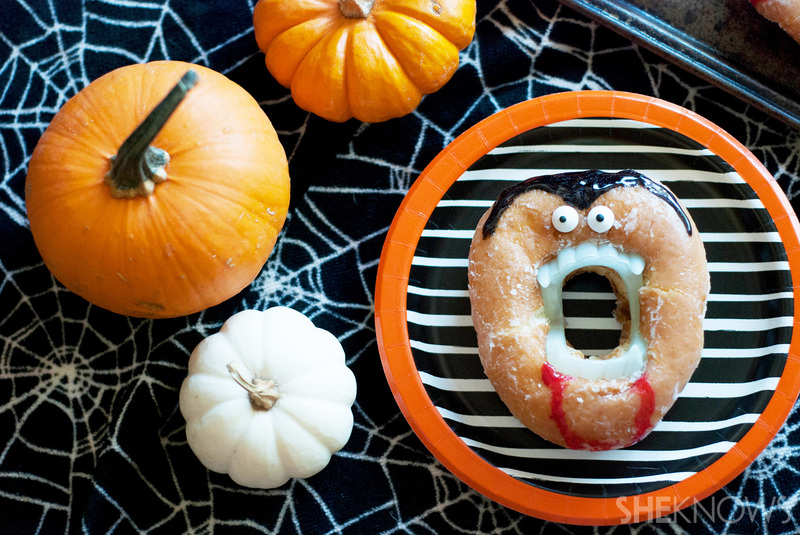 Beware, mere mortals, for the no-bake vampire doughnut is back — yes, the Halloween treat that delivers the most laughs for the least effort. 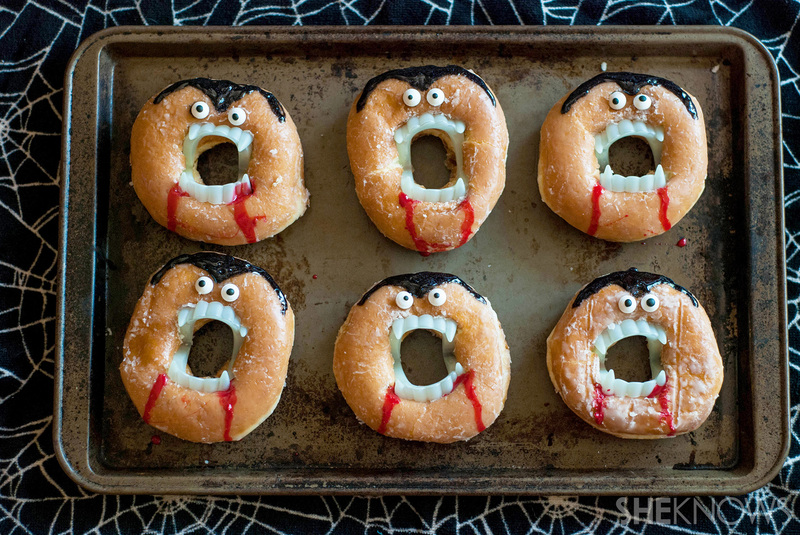 All you need are a dozen doughnuts, vampire fangs, decorative eyes and colored food gel. You will rule the night! Or at least, you will rule your Halloween party. I’ll be honest here: I am not a baker. In fact, I hate baking. I truly despise it. I think my main reason is that with baking, sticking to a solid recipe is a must, whereas with cooking, you have the freedom to go with the flow. That said, I was cruising around the net and came across this idea on Pinterest, and I had to try it out. I love the fact that these are no-bake and that you can swing by your favorite doughnut shop and just grab some fresh doughnuts for this idea. These are simple, cute and perfect for those who don’t care to bake but want something that really stands out on the dessert table. Even non-bakers can make an impressive and cute little treat for Halloween. 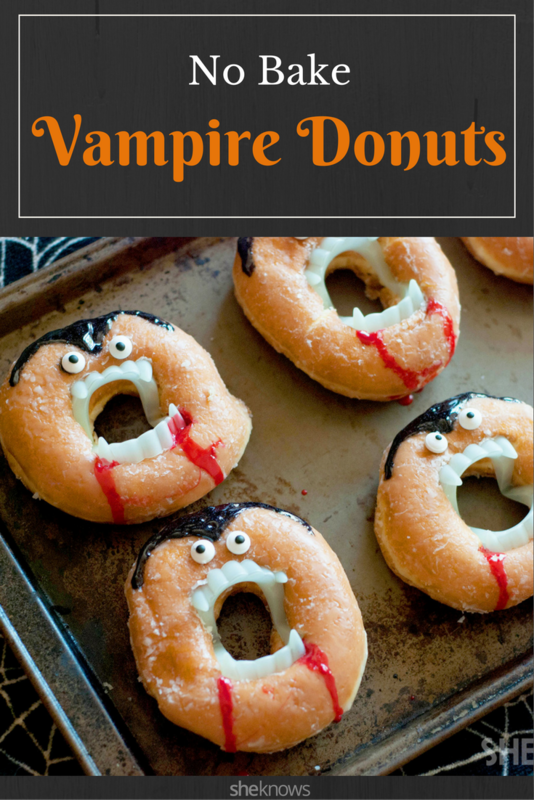 Just pick up a dozen store-bought doughnuts and some plastic fake teeth to make these funny but eerie no-bake vampire treats. Take a pair of the vampire teeth, and hold them closed. Gently place the teeth in the center of a doughnut, and then carefully allow the teeth to open. Wiggle the teeth so that they fit perfectly into the center of the doughnut, and place the doughnut onto a serving plate. Repeat with the remaining doughnuts and vampire teeth until all the vampires are made. For each pair of vampire eyes, lightly moisten the backs of 2 candy eyes, and gently press them to the doughnut so they stick. If using the black and white decorating gels to make the eyes, then first place 2 drops of white gel onto each doughnut, followed by a smaller drop of black gel directly onto each white gel eye. Use the red decorating gel to draw blood around the teeth of the doughnuts. If desired, use the black gel to draw a widow’s peak onto each doughnut or on random doughnuts. Allow the gel to dry about 20 minutes, and serve. Originally published October 2014. Updated September 2016.